Dr. Cara Kellersmith, left, and Jacqueline Cisco were sworn in as Shelby County Park Board Commissioners on Jan. 13, 2019, by Probate Judge Jeff Beigel. 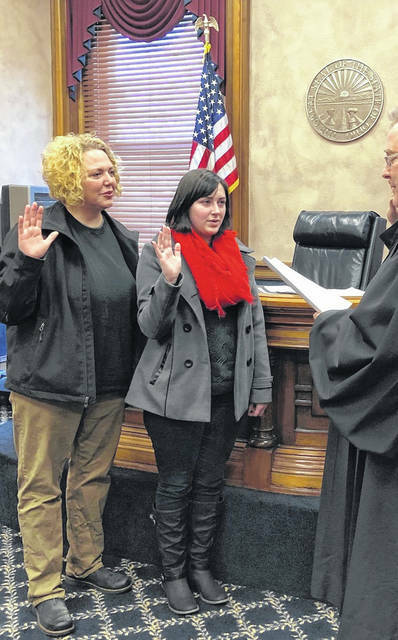 SIDNEY — Dr. Cara Kellersmithand Jacqueline Cisco were sworn in as Shelby County Park Board Commissioners on Jan. 13, 2019, by Probate Judge Jeff Beigel. They were appointed for 3-year and 2-year terms, respectively. The Park Board is responsible for overseeing the Shelby County park system. It is responsible for the protection and preservation of the parks and addresses issues regarding the conservation, acquisition, planning, development, maintenance and improvement of the park land and facilities. The Park Board currently has a vacancy. Qualified individuals interested in serving as a park commissioner may submit applications to the Shelby County Clerk of Courts, Probate Division, located at 100 E. Court St., second floor, Sidney, OH 45365. Park commissioners are appointed by the county probate judge. The board meets on the last Tuesday of each month at 6 p.m. Board members are not compensated, but are allowed expenses.